You can take away french fries, pizza, ice cream. 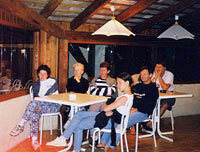 You will find a billards, a baby foot to share good moment of games between adolescents and familly. A shade sidewalk area near to the swimming pool with a beautiful view on the montains !